Idaho is gambling $15 million of taxpayer money on the promise of advanced opportunities. By providing free college-level classes, the state hopes to break down the cultural barriers that keep many high school students from continuing their education. Is it working? The state’s own numbers are mixed. According to the State Department of Education’s numbers from 2016-17, students in large districts and charter schools were more likely to take advantage of advanced opportunities dollars. But when the State Board of Education looked at different data from the two preceding years, researchers reached a different conclusion: Rural high school students were more likely to take college-level classes. However, the State Board research revealed other considerable gaps, based on ethnicity and family income. The outcome is important. Idaho’s advanced opportunities gamble carries high stakes, and not just for high school students. Idaho is desperately trying to boost its college graduation rates, and meet the changing demands of employers. Advanced opportunities is one of several state programs designed to help high school graduates continue their education. Daphne Dryden has spent the past two years juggling college homework and high school homework. The balancing act will pay off as she leaves Coeur d’Alene High School with an associate’s degree from North Idaho College — and a head start on her bachelor’s degree at the University of Idaho. She says she wouldn’t have been able to afford the college courses without the state’s help. “It’s a huge opportunity for me,” she said in an interview last fall. The advanced opportunities program provides every Idaho seventh- through 12th-grader with an allowance of sorts — $4,125 that they can use to take college classes or Advanced Placement or International Baccalaureate tests. The program is growing rapidly, and beyond legislators’ expectations. The Legislature put $15 million into the advanced opportunities line item for the next budget year, which begins July 1. The money covers the college-level courses and exams students choose to take. The state has no formula that is designed to earmark more money — or less money — to rural districts. Funding is simply a function of student signups. All told, close to 28,000 students used a share of the money. That accounts for about a fifth of the state’s high school and junior high school students. Not surprisingly, the biggest share of the money, nearly $2.4 million, went to students in the state’s largest school district, West Ada. But that doesn’t tell the whole story. Participation was high — as more than a quarter of West Ada’s students signed on. West Ada accounts for 13 percent of Idaho’s junior high school and high school students, but received nearly 20 percent of the advanced opportunities money. Next door to West Ada, participation was also high in the Boise School District. A quarter of Boise’s students signed on for advanced opportunities work — although the district received a relatively small share of the state’s money. Charter school students were slightly less likely to sign up for advanced opportunities. But those students who did sign up apparently took on a heavy courseload. As a result, charter school students received a slightly larger share of the state’s dollars. Taken together, these results raise a question. Will the vaunted advanced opportunities program really bridge the urban-rural divide — and help students go from small towns to college campuses? Tina Polishchuk sees some rural bright spots — even in the 2016-17 numbers. Polishchuk, the State Department of Education’s advanced opportunities coordinator, points out that the 15 districts with the highest advanced opportunities participation rates are all rural. And she’s right. In communities from Melba and New Plymouth to Troy and Cottonwood, participation rates far exceeded the state average. But the trends cut both ways. In 13 districts — all rural — participation rates come in below 10 percent, far below the state average. The success stories share a common thread: strong leadership. The district administrators forge strong partnerships with local colleges, and adopt a mindset that makes advanced opportunities a priority, despite the obstacles, Polishchuk says. The downside: When rural districts get a new superintendent, as happens frequently, advanced opportunities isn’t always the top priority from day one. The logistical barriers are just a fact of life, but Polishchuk says the $4,125 allowance will knock down the financial barriers. The 2016-17 data reflects the first year of the larger and much more generous state allowance. In the years to come, Polishchuk expects to see more success stories, as rural students and students from poverty invest the state’s money in their future. One floor above the SDE’s offices, Cathleen McHugh and Jean Henscheid of the State Board of Education are watching the program unfold. McHugh, the board’s principal research analyst, has the job of crunching the numbers. And in 2015 and 2016, she found that rural students were more likely than their urban counterparts to leave high school with some college-level dual credit. What’s more, the rural students were more likely to graduate high school with 15 or more dual credits — a significant chunk of credits that would give them about a semester’s jump on college, or more. From here, McHugh wants to take a deeper look at the more recent numbers from SDE. These numbers take in all advanced opportunities offerings, not just the dual-credit programs she studied in 2015 and 2016. She also wants to take a closer look at other demographic gaps. Hispanic students and students who qualify for free and reduced-price lunch are less likely to sign up for dual credit — although, again, these numbers improved in rural districts. Henscheid, the board’s principal policy analyst, has the job of looking at the human stories. She has spent the past year convening focus groups with parents and students, to get a sense of how they are navigating the dual-credit program. She’s quick to say that the SDE is working to make sure the dual-credit classes will help students toward a college degree, and she says school advisers are trying to nudge students toward the classes that they’ll need. But the novelty and the newness of dual credit is part of the attraction, especially in rural high schools, and many students want to take whatever classes they can get their hands on. “They just don’t want to leave money on the table,” Henscheid said. More reading: This year, Idaho Education News will take an in-depth look at education options after high school — with an emphasis on rural Idaho. 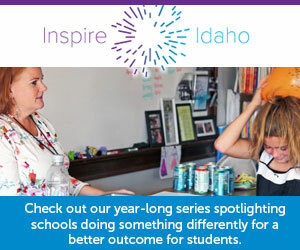 Here is a link to Idaho Education News’ award-winning series from December.